There are a lot of big, highly-anticipated games coming out next year: Watch Dogs, Titanfall, Dragon Age Inquisition. But in certain circles, there's only one game worth counting down the days for: The Legend of Heroes: Trails in the Sky SC. That oddly-titled game is the second of a trilogy and the sequel to the first The Legend of Heroes: Trails in the Sky, which came out for PSP in 2011. SC, which stands for "second chapter," will be out on PC and as a digital release on PSP next year. Finally. SC has become something of a white whale for JRPG fans over the past few years, and getting it out in the States has been a massive headache for XSEED, the U.S. publisher behind both games. See, when XSEED first announced plans to bring Trails over from Japan, they promised to release the entire trilogy in North America. That was an ambitious goal, made more difficult by both a time-consuming localization process and unimpressive sales for the first game. Worse, they were working with these games on Sony's PSP, a console that was already on its last legs. 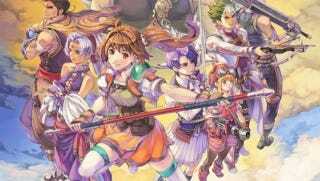 In September of this year, XSEED finally dropped the bomb: they'd struck a deal with a two-man company called Carpe Fulgur, best known for localizing the adorable PC game Recettear. Carpe Fulgur would translate and edit SC's massive script, and XSEED would publish the game. It's a lot of pressure for Carpe Fulgur editor Andrew Dice and his partner in crime, Robin Light-Williams. They've been given the reins to what might not be 2014's most popular JRPG, but, with a script clocking in at three million Japanese characters, is most definitely the largest. Now they have to live up to the standards set by the first game. "If I screw this up I may as well just jump off a bridge because my professional life will be over," Dice told me in a recent phone interview. "But at the same time, it's one of those things where neither Robin nor I would have taken the job if we didn't think we were up to it, so in that sense I don't feel that much pressure simply because I'm confident we can actually pull it off." Carpe Fulgur actually started working on the script in 2011, not long after the release of the first chapter. For two years, both XSEED and Dice kept the deal secret. They had to. Nothing was finalized. And as they kept plugging away at the script, they didn't even know for sure if anyone would even see it. It was the success of XSEED's Ys action-RPGs on Steam that convinced the publisher that Trails 2 could be a feasible release. Instead of just releasing the second Trails on PSP, like originally planned, they would put it on Steam, too. By releasing the game on Valve's huge distribution platform, XSEED could reach enough of a potential audience to make the investment worthwhile. "For a long time there was a little uncertainty if the project would actually go forward, even after the two Ys games came out," Dice said. "We had to be sure they'd sell enough to justify working on other titles, and to prove that XSEED could sell PC titles—which, by the way, they can." Dice, who had worked with Steam before, helped connect XSEED to Valve for Ys Origin and Ys: The Oath in Felghana, which quickly became two of XSEED's biggest sellers ever. Good news for anyone looking forward to SC. If the Ys games hadn't sold, "Trails wouldn't have happened," Dice told me. But the games did well, and SC is happening. The script is almost done, Dice says—in fact, they're totally done with the main story. "We are getting the script inserted into the game right now on the PC version so that we can see what works and what doesn't," Dice said. "The sidequests and NPCs and whatnot are also getting pretty close to done. We've got everything outside of the towns basically done at this point." Now that they're closer to release—XSEED is hoping to get both versions of SC out next summer—I asked if they're working extra "crunch" hours to get things done. "We aren't actually crunching," Dice said. "We don't want to crunch on Trails partially because if you really tried to crunch all the way through Trails, you die. You would die. It would take your life, either through pure exhaustion or through being driven to suicide. I'm only partially joking here." Random Encounters is a weekly column dedicated to all things JRPG. It runs every Friday at 3pm ET, except when it runs on Thursday at 5:30pm ET. You can reach Jason at jason@kotaku.com or on Twitter at @jasonschreier. Editor's note: I'll be on vacation for the next three weeks, so this is the last Random Encounters of 2013. See you next year!